The Transportation and Logistics Industries face unique challenges compared to other businesses due to the constant movement, multi-location, and fast-paced nature of the business. Transportation and Logistics Businesses also have several critical back-office business processes that can greatly impact overhead and operational costs. Transportation and Logistics Businesses face challenges like struggling in monitoring the transportation lifecycle, fluctuating freight costs, freight movement monitoring, complex route planning and supply chain management. Most companies face a myriad of issues and challenges due to the nature of the business. These issues contribute to the high overhead cost and decreased efficiency. One of the main challenges of the industry is cutting the transportation cost. The volatility of external factors like fuel cost, complex compliance requirements, and changes in market trend make it hard for businesses to forecast costs. The Next big challenge for Transportation and Logistics Businesses is route planning and load optimization. This is a crucial aspect of the business because it requires significant man hours and increases overhead cost. Another hurdle for the business is the enormous amount of information that needs to be processed by the companies on a daily basis. Collecting and analyzing the sheer volume of information can be extremely taxing to the staff and the repetitive but complex nature of the process makes it prone to human errors. The continuous advancement of technology has changed the landscape of how consumers, retailers, wholesalers, and businesses buy and sell goods. Together with advancements in technology, consumer behavior also has significantly changed from brick and mortar retail to e-commerce. E-commerce has rapidly decreased the time a product is shipped from a warehouse to household and consequently changing customer expectations. NetSuite allows businesses to tackle the new problems associated with e-commerce and cope up with the increased pace of e-commerce logistics. 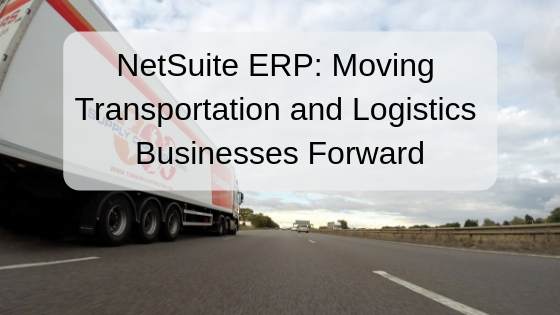 NetSuite ERP allows transportation and logistics companies to stay competitive in an ever-changing business landscape by automating crucial processes to decrease cost and improve efficiency. NetSuite allows businesses in the transportation and logistics industry to transform their business processes to quickly adapt to fluctuating demand and rapidly changing consumer trends. Businesses are also able to innovate and modernize their financials and other crucial businesses processes. NetSuite ERP Financial Management is the world’s number one cloud-based finance management system available. Netsuite provides comprehensive finance and accounting that gives businesses real-time full visibility of the company’s financials. The fluctuating fuel prices and rapidly changing cost of the business make it hard to manually track and forecast budget but with NetSuite’s Integrated budgeting and forecasting, it allows businesses to plan ahead and adjust budgets and allocation according to forecasted data that improves financial stability, reduces, cost and improves efficiency. It allows businesses to improve their financial management through financial planning based on accurate real-time data. Transportation and Logistics Company mostly transact with other business entities thus maintaining good relations with clients directly translates to more business in the future. Netsuite gives businesses complete real-time visibility to customers across multiple channels. This improves customer relationships and strengthens the customer lifetime value. NetSuite allows businesses to report revenue with confidence and accuracy. NetSuite automates a number of crucial business processes like automated generation and dispatching of invoices at recurring or custom intervals. Auto-renewal or set reminders of crucial contract renewals. NetSuite has integrated inventory and supply modules to help businesses track their assets and available inventory. In the Transportation and Logistics business, company assets are always on the move in several different locations carrying goods for several different clients on a number of routes. NetSuite allows businesses to track their assets and the assets of their customers through multiple locations in real time. The constant movement of company assets means that it is hard to monitor manually and individual assets especially during maintenance, part replacements, or upgrades. NetSuite Spend Management allows businesses to efficiently monitor, track and approve the procurement of goods and services. It also automates procurement for recurring needs that includes pre-negotiated terms, tier pricing, and prespecified delivery schedules. NetSuite has Real-time Business Intelligence. Businesses have access to the latest in reporting and analytics that give them instant, real-time visibility of all business and financial transactions. NetSuite allows businesses to generate accurate reports and dashboards that combine operation data, and financial data together with key performance indicators. NetSuite for Transportation and Logistics has several core features targeted for the fast-paced industry. NetSuite allows business to track and monitor their asset and their customer’s asset from multiple different locations. NetSuite Solutions Provider Partners like Excelym help businesses in the Transportation and Logistics industries full leverage NetSuite’s capabilities to increase efficiency and reduce cost.